A few images from Rio Java at Las Cruces from 2013, including some photographs of partially buried litter bags from Mel’s project. Leaf litter is varied and thick along wet forest trails. Mel, one of my students, is building a study investigating decomposition of leaves from a native tree Miconia appendiculata and an invasive bamboo Phyllostachys makinoi in streams. Here, she’s recruited some others to help her collect bamboo leaves. 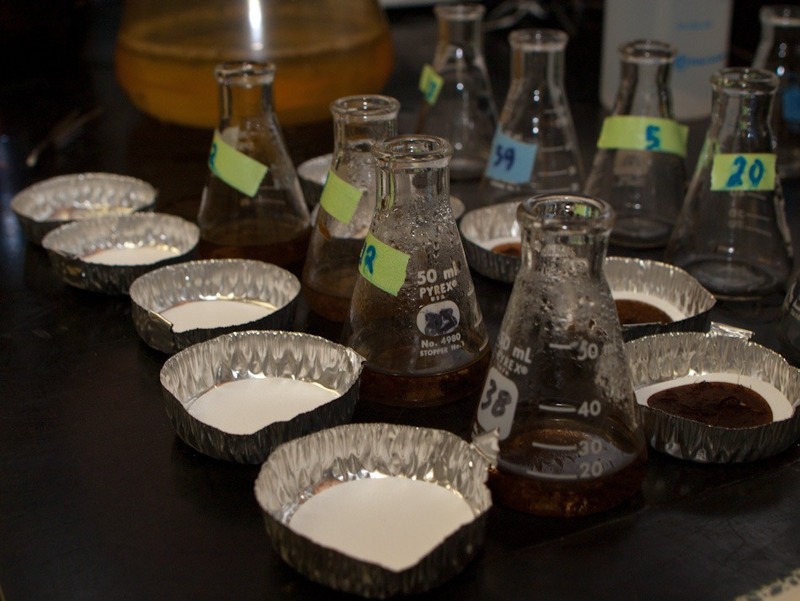 Some standards and polar extractives used to determine total phenolic content in litter samples. Back in the lab, doing some chemistry on plant litter from Costa Rica. I didn’t think to take photographs until I was almost done with this step in the process – just imagine these 24 vials times, say, 32… that would have made a cooler photograph. Using a 50:50 mix of methanol and water, I extract a tea from ground litter samples. Each one of the vials has about 0.05 g of powdered litter in it. These samples need to be centrifuged so I can remove the 'tea' extract. The glowing Stop button on the centrifuge. Rio Claro receives a substantial amount of leaf-input from surround trees, particularly in the dry season. Organic matter processing and the importance of these inputs are little study in tropical streams, especially in comparison with temperate systems, where we know that excluding this vital energy source dramatically changes in-stream communities, which can then affect terrestrial, riparian ecosystems. Given the great abundance of invertebrates, like shrimp, that are likely shredders and biofilm-grazing snails, it’s likely that tropical streams operate similar to temperate streams… Anyway, here’s some leaf packs. Because 60 small (50 mL) flasks look cool. Add concentrated sulfuric acid and produce an oxidized slurry of organic matter. Today, with the much-appreciated help of a few volunteers, Jessica’s artificial loaves of leaves were set in the stream. The next couple of weeks will include some intense sampling and processing efforts, but given the work done today, it won’t be a problem. Nine artificial loaves were attached to stakes set into the stream bed in five different riffles. The nine include two leaf treatments, previously conditioned in the stream and unconditioned. Jessica will be sampling them to examine winter invertebrate colonization and FPOM deposition. Or artificial loaves of leaves, Jessica, another undergraduate student working in my lab, is investigating leaf pack dynamics in an Ohio stream. She has characterized leaf accumulation in the field, and, unfortunately, seen the rapid washing of her samples during a mild flooding event. The next step is to characterize a few variables that may be important in leaf packs within streams (i.e., invertebrate community succession and FPOM accumulation) using artificially constructed leaf packs… or loaves. Below, leaves where pierced onto a kabob with the help of a couple of volunteers.